I recently had the good fortune of attending a conference in Atlanta sponsored by US Campaign coalition member group Friends of Sabeel-North America (FOSNA). The conference, From Birmingham to Bethlehem: The Power of Nonviolence in the US and Palestine-Israel, featured a variety of workshops and plenary speakers linking the nonviolent resistance of the US Civil Rights movement to the ongoing nonviolent Palestinian resistance to Israeli occupation and apartheid. Legendary civil rights activist Dr. Bernard LaFayette implored conference attendees to join in solidarity actions with the Palestinian Freedom Riders, Dr. Beverly Guy-Sheftall spoke of her trip to the West Bank in June as part of a US delegation of women of color feminists, led by US Campaign Advisory Board member Barbara Ransby, which subsequently endorsed the Boycott, Divestment and Sanctions (BDS) campaign against Israel. Kennesaw State University Professor Jesse Benjamin led a packed workshop on whiteness in the Jewish-Christian Zionist embrace, and US Campaign National Organizer Anna Baltzer gave a dynamic presentation chronicling expanding apartheid conditions on the ground in Palestine-Israel eloquently advocating for boycott, divestment and sanctions (BDS) as a powerful form of nonviolent resistance. FOSNA has organized 33 regional conferences across the US over the last nine years and they have several scheduled for next year. If you have the opportunity to attend one, I would highly encourage you to do so. It was a challenging and richly rewarding experience. In keeping with FOSNA’s mission of engaging North American Christians on the issue of a just peace in the Holy Land, many of the workshops focused on the moral, legal and theological basis from which US churches can work to end US complicity in the occupation. One of the recurring points of discussion throughout the conference was how US churches should respond to calls for “balance” when discussing the Palestine-Israel conflict. This is a particularly tricky issue for progressive US churches, many of whom feel a need to atone for Christian anti-Semitism and complicity in the Holocaust, and have admirably dedicated themselves to building relations with the Jewish community via interfaith dialogue and reconciliation. While invoking the need for balance in discussing the conflict seems reasonable enough, it is almost always employed as way of normalizing the relationship between the oppressor and the oppressed. Several conference speakers, notably author and activist Mark Braverman, noted that in practice this means interfaith dialogue far too often results in Christian theologians refusing to condemn or even discuss Israeli human rights abuses against the Palestinians. And where there is criticism of Israel, it is almost always accompanied by recognition of Israeli suffering as somehow on par with the suffering of Palestinians living under the scourge of apartheid and occupation. The apparent reasonableness of entreaties for balance and dialogue helps explain why normalization is such an insidiously powerful and effective discourse. The issue of normalization was also the focus of a skills-building workshop led by a Columbia University SJP member, cartoonist and solidarity activist Ethan Heitner, and US Campaign National Organizer Anna Baltzer at last month’s National Students for Justice in Palestine Conference. Columbia SJP and Adalah-NY, of which Heitner is a member, are both US Coalition member groups. Palestinian solidarity organizations on US campuses are often challenged by Zionist student groups to organize events together to present both perspectives of the conflict. 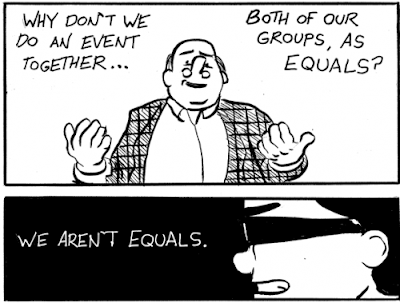 In order to help student groups (and other solidarity activists) better understand and explain how normalization legitimizes Israel’s oppression of the Palestinian people, Keilani and Heitner created a comic. The comic, titled “Nothing Normal About It,” does a great job of bringing to life how normalization misdirects attention away from Israeli crimes and frustrates our efforts to educate people in the US about the conflict. Rafeef Ziadah’s spoken word performance of her poem “We teach life, sir,” exploded across the internet this past week because she creates a narrative which simultaneously unmasks the violence of the Israeli occupation and the complicity of a noxious discourse that excuses Israeli brutality by invoking that great racist colonial trope of the Palestinians as uncivilized barbarians who can only be tamed through brute force. In a mere four minutes, Ziadah turns that discourse, so often repeated in the media, inside out and exposes its moral shallowness. This is the power of the insurrectionary imagination. As we move forward as a movement, we must be consciously open to seeing, speaking, listening and thinking differently. We must believe in the power of our imaginations to help dissolve the boundary between dream and reality to create a world of unbounded freedom for all. Freedom Riders on the West Bank? Today's Gaza Flotilla: Spread the Word!! !